Jelco Tonearm FAQ provides answers to frequently asked Jelco product questions. All information in the FAQ is fact checked with the help of Jelco in Japan and the Canadian Jelco distributor PSE Audio Products. HS-25 is the premium headshell, provides azimuth adjustment, and is the included with the SA-750 tonearms. It is 12g. HS-20 looks similar to the HS-25 and also offers azimuth adjustment. The main difference is that the HS-25 finger lift is secured with the same bolts for the cartridge, which is an awkward design. The HS-25 finger lift is secured to the side of the headshell, making cartridge mounting much easier. The HS-20 is also sold by Sumiko as the HS-12. It is 12g. HS-50 is the low cost headshell with no azimuth adjustment. It is 9g. The premium HS-25 is included with the arm. The HS-50 does not include azimuth adjustment. Both are available in tonearm accessories. The Linn arms are normally 211mm pivot to spindle. The Jelco SA-250ST is 210mm pivot to spindle. The Jelco SA-250, SA-750D, and SA-750DB are 214mm pivot to spindle. The small difference in length can be eliminated by making a slight (+1mm or -3mm) adjustment of the cartridge position in the headshell. Here is the complete set of specifications for the Jelco tonearms. The effective mass of the Jelco 750D 9″ tonearm with the standard headshell but without cartridge is 13.48g. SA-750D effective mass is 13.48gr without cartridge( effective mass is 19.23gr with 6.5gr cartridge). We think that the higher compliance cartridge is usable to SA-750. The standard HS-25 headshell weight is 12g. The economy HS-50 headshell weight is 9g. So it is possible to further reduce the effective mass by using the HS-50 headshell. All Jelco tonearms use a standard Linn tonearm mount. Here is the mounting template for the 12″ SA-750DB tonearm. The mount for the 9″/10″ SA-750, 9″ SA-250, 9″ SA-250ST. From the drawing one can see that the center hole for the arm tube is 30mm diameter. There are three mounting screws 120degrees apart on a 48.2mm diameter circumference. Yes. The 10″ Jelco SA-750E (Chrome) and SA-750EB (Black) both fit comfortably on a 14″ long tonearm board/plinth. For our customers convenience, we have scanned the tonearm mounting template for each tonearm in PDF form (link found in the product page for each tonearm). 9″ Jelco SA-750D/SA-750DB fit on a 13″ deep plinth. Exact distance from tip of arm lift to end of counterweight shaft is 12″/30.5cm. 10″ Jelco SA-750E/SA-750EB fit on a 14″ deep plinth. Exact distance from tip of arm lift to end of counterweight shaft is 13″/33cm. 12″ Jelco SA-750D/SA-750DB fit on a 16″ plinth. Exact distance from tip of arm lift to end of counterweight shaft is 15″/38cm. No experience with the Yamamoto headshells, however if you do a Google search you can read the comments in some of the audio forum threads (VinylEngine, LencoHeaven, etc). The Jelco HS-25 which comes with the 750 tonearms is 12g in mass. My advice is to mount the cartridge with the HS-25 first then determine make a decision on how light/heavy you can go with the headshell. The Yamamoto headshell mass varies widely depending on the model. Many people are running the Jelco SA-750D tonearm on a Lenco L75 turntable. The Jelco mounting base (30mm diameter hole required) will fit in the Lenco armtube hole and you simply bolt it to the top plate. The Lenco tonearm pivot to spindle distance 210.8mm is very close to the Jelco distance of 214mm. You will not find another tonearm (at least under $2000) with a closer match. The few mm difference can be fixed by putting the cartridge further back in the headshell. Here is a link to the Jelco SA-750D mounting template. It provides dimensional information. The Jelco JL-45 Cueing Device (Tonearm Lift) is compatible with a number of ‘OEM’ Jelco tonearms, but there have also been instances where an “OEM” Jelco arm looked the same as a Jelco model, but there were differences and the JL-45 couldn’t be used. The user should get a caliper reading of the cylinder diameter and compare it to the JL-45 (0.50″). 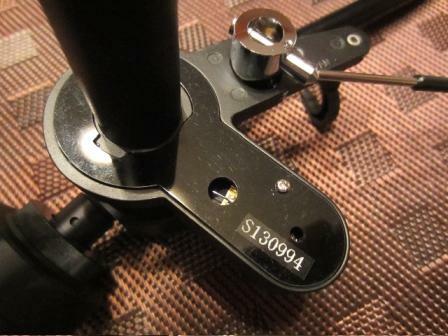 The tonearm lift support should also have a hex set screw to secure the cueing device. The bottom part of the cueing device cylinder where the cueing lever is attached is 0.530″, although this dimension is not critical. The height of the cylinder is 0.871″. Also note that some earlier Jelco lifters had a guide pin that could bind if not properly positioned in the holder. 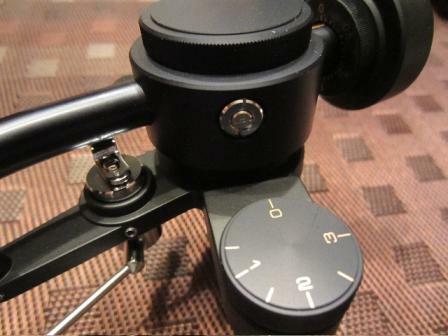 BTW: The Jelco JL-45 is also used as the cueing device for a number of high-end current production tonearms as well. The two tonearms are very similar but are not identical. Jelco manufactured all of the Audioquest PT6 tonearms. Also the Audioquest tonearms are discontinued so that SA-250ST may have some design improvements. Here is the information on the Audioquest PT6 and Jelco SA-250ST. Jelco tonearm anti-skate design on the current tonearm models SA-250ST, SA-250, SA-750 is simple, yet quite precise. 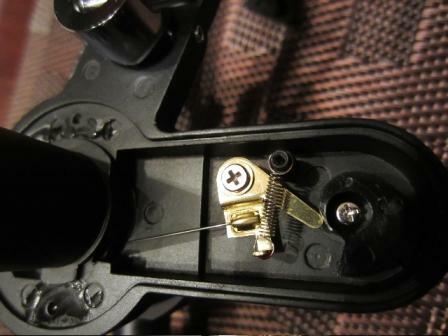 In the “zero” position, the spring wire does not make contact with the rotating arm pivot, so there should be no anti skate force normally applied. However, the OEM arm made for AR, Revolver, Mission and others may not have been exactly the same and it’s possible that there might be a slight anti-skate compensation applied near the inner groove area if it isn’t able to fully disengage itself. Some amount of anti-skate compensation would be expected by the arm manufacturer, so perhaps less precise design was used (cost reduction) that applied correct pressure within the normal range, but didn’t fully disengage at the extreme end of the arm travel. Another thing to remember is that the arm/turntable need to be perfectly level, otherwise there may be some gravitational pull due to the bearings not being in an equal horizontal plane. Rather than trying to alter spring tensions and alignments, that the customer try to determine if the turntable is level first (not the plinth, but the platter and arm board), and then see if the arm drift occurs only for the last half of the record area, or over the entire range from the arm rest all the way to the spindle. If it’s only during the inner half of the record, then it would be the equivalent of about 1/4 gram anti-skate force. If it drifts back all the way to the arm rest, but barely, then it would be the equivalent of 1/2 gram. I would then suggest just setting the anti-skate dial to a bit less than the tracking force to allow for the discrepancy. It’s always better to have a bit less anti-skate force applied than too much. It is possible that Rega tonearm is mounted using an incorrect pivot to spindle distance, especially if it is mounted in the standard Linn hole. The small difference in length between Linn and Jelco tonearms can be eliminated by making a slight (+1mm or -3mm) adjustment of the cartridge position in the headshell.